Back in 1992, Thrash Metal started to collapse. Although PANTERA was on the rise, many of the notorious names of the genre were changing their styles to fit into the modernity of those days, or splitting up due internal problems. The main cause to be blamed: the rise of Alternative Rock, what ended Glam Metal reign, and Thrash Metal (as all Metal genres) were somehow attached, so the victory or defeat of one of them would be felt by the others. But as nothing in Metal is permanent, Thrash Metal came back in the same way it was in the 80’s, and evolved. That’s the scenario where SOLITARY, a quartet from UK, is, and now, a new release for their first album, “Nothing Changed”, is here. The original release was on 1998, when the genre was coming back from a long slumber on the underground, but we can feel on their songs that they had a strong and deep Thrash Metal root on same way as TESTAMENT, METALLICA and others who used melodies along the natural aggressiveness of the genre. As well, they have a fine technical approach on their songs, and let me tell you: the songs from “Nothing Changed” sound as actual as this album released today. Peter Knight produced, recorded, and mixed the album (and made the photos as well) on the original release, having the hands of Chris Thorpe on the mastering. We can see that the resources they had back on 1998 were very good, besides it could be a bit cleaner, it’s very good in the way it is. There are some studio adjustments to make the album palatable for modern days, but nothing that would damage the original sound quality. Musically, they weren’t playing something new at all on those days, but their music is really excellent. An the fun is guaranteed by moments as the energetic “The Downward Spiral” (very good work on the rhythmic kitchen, with bass and drums guiding wisely the slow rhythm), the abrasive guitars on “A Second Chance” (and a very good technical insight on bass guitar), the harsh and filthy “Bitterness” (very good vocals, and a catchy chorus), the modern grasp of “No Reason” and “Fear”. And as a gift for the fans, here are presented the 1996 Demo Tape versions for “A Second Chance”, “The Bottom Line”, “What Price”, “No Reason” and “Fear” (and all of them appear on “Human Condition” EP as well). 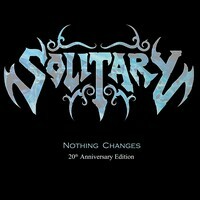 At least, we can say that this 20th anniversary edition of “Nothing Changed” shows that SOLITARY is a name to be respected and appreciated by Metalheads of all ages.